This little Zen koan I came across in Ruth Ozeki’s wonderful novel ‘A Tale for the Time Being’ reminded me of a classic issue in screenwriting. 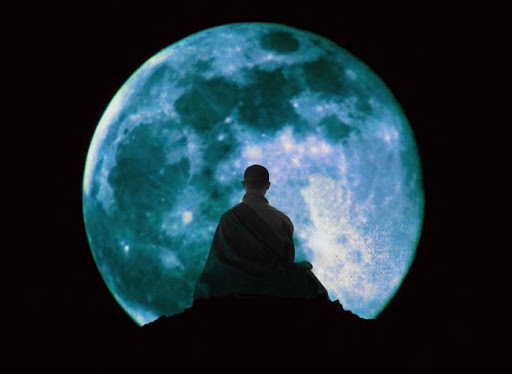 Let’s think of the moon in this Zen koan as an analogy for a good story and the finger as the methods that supposedly point to how to write one. There are a great many people, including myself, who study screenwriting methods to find more effective ways to write better-resonating stories, just like there are many people who study the Buddhist texts to understand and practice Buddhism and attain enlightenment. I wonder though, if someone who is illiterate in the methodology of screenwriting couldn’t look past the methods to directly experience and deliver the essence of a good story. If a ‘good story’ is the truth we all are striving to arrive at in screenwriting, can we be mistaking the ideas on screenwriting for the truth in it? While I am a true believer in studying, analyzing, reflection, comparison, methodology and so on, I also feel that theory in general may create grounds for a trap where our writing minds and our written words are suffocated with all the knowledge, ideas and limitations that come from over-preparation. We should be careful not to let the theory get in the way of the creative power of the practice of writing. A free mind is a lively imagination’s best friend. It’s surely important to furnish that free mind with a great big library of inspiring inhabitants, but it’s equally important not to restrict it with preconceived notions of what it should eventually produce. Methodology can also become a trap as it encourages procrastination. Long after a writing project is ripened with enough ideas and enthusiasm, we can be inclined to come up with endless material to read and more interesting methods to apply that we may be risking losing the passion required to dive into it. Sometimes, the more we dwell the more we lose focus and drive. Having read quite a few screenplays, I feel that there is a drought of creative juice and courageous daring in scripts. There is also a huge lacking in form and method – the essentials for the craft. Whether it be your ‘practice’ or your ‘theory’, be sure to nourish them just the right amount and avoid being limited by either of them. Take care to always look for the ‘truth’ of a good story within the madhouse of your imagination and make sure not to get bogged down by the finger while searching for the moon. I wish you the moon in the New Year! If you’re in the dangerous habit of reading tips for screenwriters, you will see that the most common advice for screenwriters (and writers in general) is to write, write, write… Keep writing! Don’t ever give up! The more you write the better a writer you will be! This message must have resonated with many, since I see an awful lot of screenwriters (mostly beginning writers, in my experience) churning out new scripts incessantly, seemingly a dozen a year, or may be more. 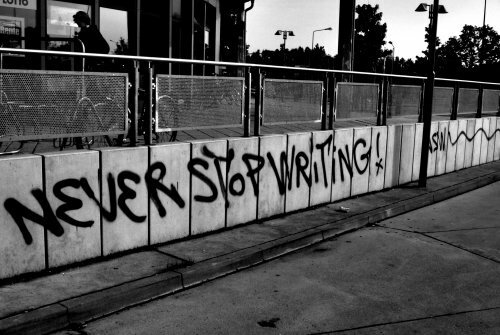 Well, my humble advice is: STOP WRITING! For one, there is a fine line between when is a good time to quit trying to become a screenwriter altogether and when you should be fuelled with a stronger desire to keep going. I think the writers who succeed as screenwriters are not the ones who don’t give up, but those who CANNOT give up. If there is nothing else that makes sense for you to do, then you don’t have to worry about whether you should go on or not; you just have to keep doing what you gotta do. For those who can think of other things that they would like to do and are good at, may be it’s better to move on sooner rather than later. Most important thing to do is be intelligent about how you look at your work and listen to your gut feeling. Second, I will bet for every million people who are writers or wannabe writers, there are about a thousand who are good writers. Out of that thousand, I would guess only a hundred would be consistently producing good material fast. Talented and prolific writers like Stephen King would be on that list of rare species. For the rest of us, simply writing a lot doesn’t make us better writers but only gives us more examples of bad-to-mediocre writing. Writing a lot will no doubt make a good writer a brilliant one, but writing LESS may be a much better remedy for bad writing. You may be one of the thousand good writers out of those million die-hards, but I am writing this letter to the 999,000 of us out there. I have taken up the strange profession of spotting and solving screenwriting problems. I think I have done this partly because I have an academic background in filmmaking and consider myself more academic than creative, and partly as a way to avoid my own bad writing. I have been fortunate to read more scripts than usual recently and it led me to wonder why so many people write so much. Every script does have some interesting aspects that could be developed, reformed and evolved into good stories, this is true. However, I often notice how quickly and carelessly stories are (or feel like they are) put together. How easy it is for most to transform half-baked ideas into less than half-baked stories. Why? Why keep on writing when you have never seen anything like what you’ve written on the big screen; when your script doesn’t resemble any movie that you love? Before you even begin to compare your work with others, ask: Why do you love the movies that you love? What is it about those stories and characters that touch your core? Study those stories that are so great, find out why they are good, and then find out how they got to be good. After that, you can look back at your script and compare your findings in both. Why oh why yours is not as good as ‘that’ and how you can make it that good. Spot the differences; write down those differences, and again, figure out what in your writing and life experience may be missing that you weren’t able to write that good. Do you really think the difference between the two comes from writing like a maniac without stopping to question whether it is any good? May be, but not necessarily. Do you think it’s because those great writers were born with the good writing gene? May be, but not necessarily. I think the most obvious difference is that good writers are first and foremost better at living than writing. Living and observing the act of living is the main resource for any writer. Writers can be socially awkward and dysfunctional in real life, but it is in the observing of it all that makes the difference. It doesn’t matter what you and your life are like, it matters how you understand and process it. A gift for imagination probably comes next and I don’t think that’s necessarily God-given either. I think the gift of imagination is bestowed due to having gathered so much observation and emotional experience that you are able to empathize with a door handle. You can empathize with people and things so much and so well that you can make anything up and still feel your way into the veins of the story that is living in it. For your imagination to grow, don’t just watch movies because the process of watching a feature-length movie is so quick; you follow the plot but you hardly notice the details. In addition to watching movies, read books. When you read, places, people, settings, objects, feelings, moments germinate and flourish in your imagination. The more of those you digest in your mind and heart the bigger a library of stuff you will have to draw from in your own writing. This is how you grow imagination: by imagining more stuff, slowly and thoughtfully. Probably only the third trick to good writing would be the actual practice of writing. NOT the practice of writing for the sake of writing, but the practice of intelligent writing that comes from intelligent living and observing. I think there is a secret for the practice of writing and it’s hidden in the sacred times in between writing spurts, meaning when you DON’T write, meaning when you live and breathe and do your laundry and wash the dishes and walk your kid to school. It is in these ordinary moments that you are a potential protagonist rather than a writer who orchestrates uninteresting characters that don’t feel real. YOU are real when you’re doing your laundry and thinking about the fight you had with your wife last night and fearing that she might bring it up again or sulk all day and how you should compose yourself so you can survive this last storm. Watch yourself while you pour the detergent and purse your lips at the thought of last night’s quarrel and how your heart skips a beat when you momentarily reminisce a time when you never had fights. There is a story emerging, developing and ending in your act of living every day. You can project the same sensibility that is required for watching that story unfold inside you onto any character you might think up and what you will end up with is a story with conflict, motivation, goals and desires, risks, tension, obstacles, stakes, lessons and resolution. YOU ARE SKIPPING THE ONGOING STORY YOU’RE LIVING AS YOU CONTINUE TO WRITE STUFF THAT DON’T REALLY HAPPEN QUITE THAT WAY, STUFF THAT DON’T MATTER, STUFF THAT ISN’T MEANINGFUL OR IMPORTANT. So, stop the writing and concentrate on the living, and observing that living. Pay attention to the intricacies of your thoughts and emotions for there is no screenwriting book or advice column that could be more useful to you than what you already have going on in you and around you. Of course, don’t stop writing altogether and spend your time staring at walls playing with your hair. Be aware of your act of living first. Then be aware of your writing and what’s not working with it. Figure out why. Don’t fool yourself. Write less and read more. Do less and notice more. Look less and see more. Worry less and feel more. Try less and listen more. Write less and live more. Live more and pay attention more. Then… write what you know and feel about life and how that life works. How people in that life work. How you, as the unique representative of all of mankind, live and function in this life that is nothing but a story. See that story and write that story. In any case, this is what I tell myself as I tumble through my own ordinary life and my advice doesn’t really matter. Susan Sontag says “a novel worth reading [or, a story worth telling] is an education of the heart. It enlarges your sense of human possibility, of what human nature is, of what happens in the world. It’s a creator of inwardness.” My question to you is: how would you create inwardness without stopping to go inward? — Excerpt from The Paris Review interview with Susan Sontag, The Art of Fiction No. 143. Read full interview by Edward Hirsch here.